Taonga School started in 2011 on the edge of Luaska in Ibex Hill. In 2018 the name of the school was changed to Tembenukani Christian School. We have just over 150 pupils at the start of 2018. In 2010 a class for 8 pre-school children was started by Abi who was home schooling some of the bigger boys living at Old MacDonalds Farm. At the beginning of 2011 five girls came to the gate asking to also come for lessons, they were sent away and told to come back the following week with the person they stayed with. They came back, with 30 other children! Taonga School had begun! The pupils from Taonga school all come from poor families that cant afford the books and uniforms needed to send their children to a government school. The children do not stay with us. They come every day, walking on the road alone, from as far as half an hour away. Taonga School charges a small amount each month. The fees are deliberately set at an affordable rate for each family and if they are unable to pay they are offered work on the farm or at school. They are given a uniform after attending school for a month. When they outgrow the uniform it is replaced. If their old uniform is in good condition we keep it for other children to use. Books and other stationary is provided for the children. Every day the children have 'breakfast' of bread. Through our partnership with Arise Africa we also now feed them lunch consisting of nsima, vegetables and a protein in the form of eggs, soya pieces or beans. January 2015 saw the opening of 3 purpose built classrooms which give the children plenty of room and stops the need of moving resources from building to building. In 2017 our new block was completed which has two new classrooms and two offices. We also converted a shipping container into a library which is now full of books. The word Taonga means we are thankful. The name was chosen by the parents after school had been open for about a year. Since we started we have so much to be thankful for! Taonga School was started for children in the local area whose families could not afford to send them to school. We believe all children should have a chance to receive an education. 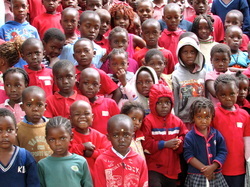 Taonga School aims to give the children a good quality education for a small fee every month. In return they recieve everything they need for school from books to breakfast. Not all of the children at Taonga School will finish their education. We aim to develop a love of learning in the children so they will continue to grow when they leave us and in the future will prioritise education for their children.